So the schools are open, the monsoon is arrived (with a major bang) and yes, the latest issue of the knowledge magazine – Safari – is also arrived. 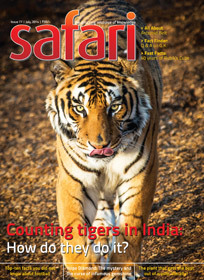 Here are our personal reviews for the July 2013 issue of Safari magazine. The cover page show the snowy tops of mountains and people tracking there. It is about an article related to one of the biggest victory of mankind against tough conditions and odds, the conquest of Mount Everest, the highest point on the earth. The article title suggests that it is not just another tale about how the Mt. Everest is conquered by two men (and their team). It promise us to bring some factual information about why it took almost a 100 years to conquer it. Yes, you read it right. Actually surveyors of India discovered about Mt. Everest in 1852 – and Tensing Norgay and Edmund Hillary have conquered it on May 29, 1953. It may be a co-incident but the gap is slightly more than a century. And if you have noticed the 60th anniversary of the event is just pass by one month ago! So, it would be interesting to find the details about what situations make it very tough for the adventurers to conquer it. The article is spread over six page and is a good read. The inside cover page of the magazine shows the photo of the leaning tower of pisa. This high resolution photograph is very different than the most famous photographs we have seen for the same. It is definitely and interesting read. Recently it was declared by BSNL that inland telegram service in India will be shut down rom July 15, 2013. Because of the revolutionary changes came to effect in the communication sector, it feels that the service of telegraph is obsolete now. It would be interesting to take a look at the 163 years life of this service. There is an article discussing 10 facts about the service. It is worth to read about this soon to be legacy as this language of dash-dot is probably contains the root of binary language in communication – which is the heart of computer and other electronic devices we use for communication. When reviewing the last issue of this magazine, we referred that there is an article about – King Tut’s Mummy – in the same. The article continues in this issue and refers more mysteries and facts associated with King Tut’s Mummy and the treasure associated with the same. Mystery lovers will like this 7 page article. Smart Watch – this gadget is in talks now. In simple words, you can wear it on your wrist (of course), pair it with your mobile phone and then manage you mobile device from the wrist watch. Looking like a spy gadget right? Read more about the options avialbe for the same in the market in – Fast Facts – segment, in summarized manner. The last issue of the magazine have had an article about some science scholars and how their prediction about some of the inventions went wrong. The article continues. Why does it take up to 2 hrs longer to fly from Europe to America then it does to come back? On what basis is the tonnage of various types of ships measured? How can some kinds of fish, such as lungfish breathe out of water and absorb the oxygen in the air? Is there a characteristic that makes a poisonous mushroom identifiable? When has been the biggest and the most powerful rocket made so far? How does a submarine’s periscope work while the vessel remains submerged? To what extent a person’s blood pressure vary during the course of his normal 24-hour day? How strong is gravity compared to the other three forces of nature? Which was the first country to adopt the genuinely democratic system of government? How many salts and minerals are locked up in the world’s oceans? If an Olympic high jumper clears a 6 feet high bar how high will he be able to leap on other planets as well as the Sun? The – super quiz – this month is oriented to the – historic milestones of the 20th century. The last cover page contains a detailed article about – Boeing 787 Dreamliner. This is the fist issue of the magazine where two articles from the last issue are continued. The articles are well balance and diversified in terms of topic. Most of the articles are detailed and it makes the magazine worth a read.